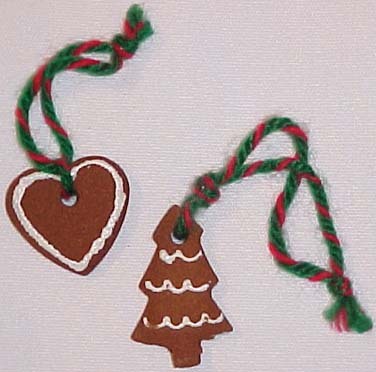 - RECIPES - CINNAMON APPLESAUCE DOUGH ORNAMENTS, GINGERBREAD PLAYDOUGH, GINGERBREAD, RUDOLPH SANDWICHES - Teachers.Net Gazette - STRESS RELIEF, STUDENT MOTIVATION, ORGANIZATION IDEAS, CLASSROOM MANAGEMENT, LESSON PLANS, DISCIPLINE, AND MORE - featuring columns and articles by top names in education and your teacher colleagues around the world! The Teachers.Net Gazette is a clearinghouse for teacher writing, from well-reasoned education essays to teacher prose, poems and humor! Bookmark the Teachers.Net Gazette and tell a friend! Mix the ingredients together until a dough forms. Use cookie cutters or other implements to cut out the shapes you desire. Cut out a hole at the top of each with a drinking straw so you'll be able to thread a ribbon or string (for hanging) when dry. It takes 4 or 5 days for the ornaments to air dry. You should turn them over frequently so they will dry evenly and won't curl. You can outline each shape with puffy paint to make them more special. Mix ingredients, knead, roll out and cut out shapes with cookie cutters. Use a drinking straw to form a hole at top before drying. After dry (in about two days depending upon temperature and humidity in the room), you can craft paint details and thread a ribbon or other tie through the hole for hanging. Note: While drying, flip over occasionally so the ornaments will not curl up. Mix the dry ingredients. Play with the spices until you get the scent and color you want. Mix the water and oil together first THEN add to the dry ingredients and stir. Cook the mixture over medium heat for two or three minutes, stirring constantly until the dough starts to pull away from the sides of the pan and clump together. Take the dough out of the pan and knead it until smooth. This is the real thing. Serve warm with whipped cream for a special holiday treat. Happy holidays! Sift together all dry ingredients and add to the wet ingredients. Wisk the mixture to mix until there are no lumps. Bake in a greased and floured loaf pan at 350 degrees for about 45 minutes. Cut a piece of bread in half crosswise to form 2 triangles. Spread each half with peanut butter. 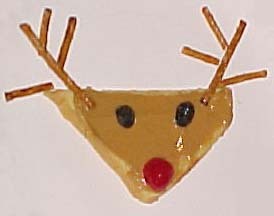 Use pretzels for the antlers. Use raisins for the eyes.